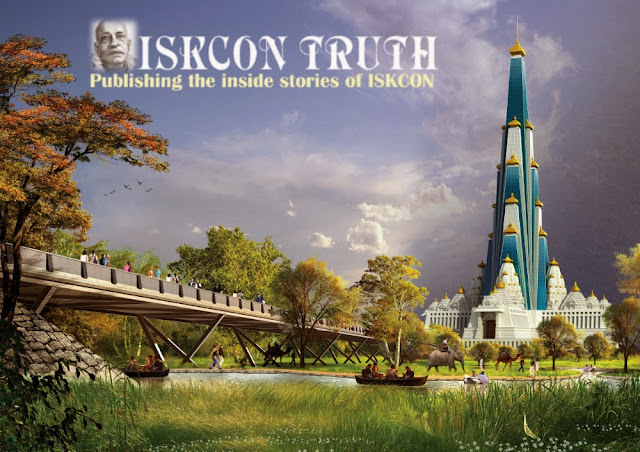 ISKCONIRM: In previous issues, we have exposed various attempts by ISKCON guru and GBC HH Hridayananda Dasa Goswami ("HD") to minimise Srila Prabhupada. This article continues with this theme. All quotes in the shaded boxes are taken from an initiation talk given by HD on 29/5/18. All emphases added. 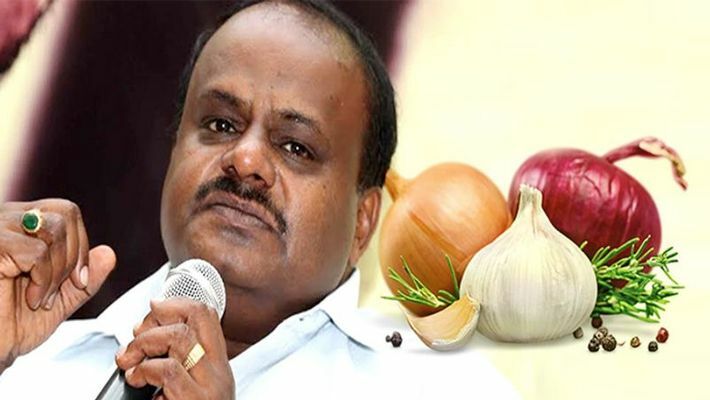 My Nation: Bangalore/ New Delhi: ISKCON's Akshaya Patra Foundation, which provides midday meals to 4.43 lakh children every day in Karnataka, has been asked by the HD Kumaraswamy government to add onion and garlic to the food it serves. Why? 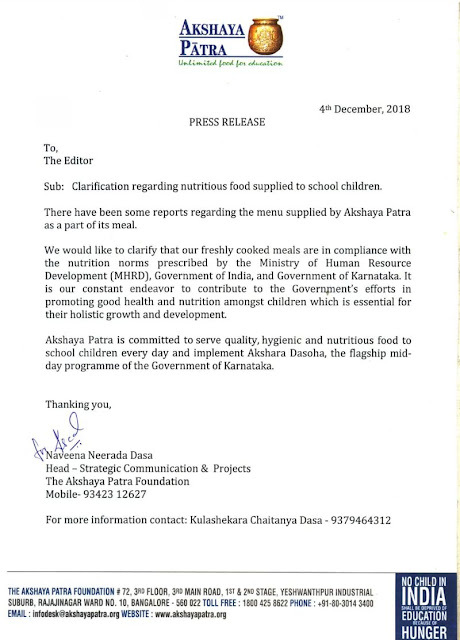 Because the state government believes these two ingredients will significantly boost the nutritional value and taste of the foods served to the children. Even if that is against the religious belief of the organisation. And as if those are the only ingredients that can boost nutritional value! This controversy has been cooked up by the JD(S) government of which the Congress is an ally. According to the rules and beliefs of the Akshaya Patra Foundation, only ‘satvik’ ('pure') foods are prepared and served. Onion and garlic don't find a place in that category; they are considered 'tamasik' (inducing negativity) and are hence not included in the meals served by the foundation. As a result of the harsh order, the foundation has discontinued its partnership with the Karnataka government for the midday meal scheme, refusing to sign the memorandum of understanding (MoU), reported DNA. Akshaya Patra Foundation USA raised nearly $500,000 to help feed underprivileged children at their annual New Jersey Benefit Gala on Saturday, October 6, at the Newark Liberty International Airport Marriott in Newark, New Jersey. Celebrity chef Sanjeev Kapoor inspired the more than 400 business, non-profit, government and philanthropic leaders, who gathered for the meet. The Consul General of India in New York Sandeep Chakravorty was the chief guest at the gala. Also in attendance were PadmaShriDr. Sudhir Parikh, founder and chairman of Parikh Worldwide Media, and his wife Dr. Sudha Parikh. 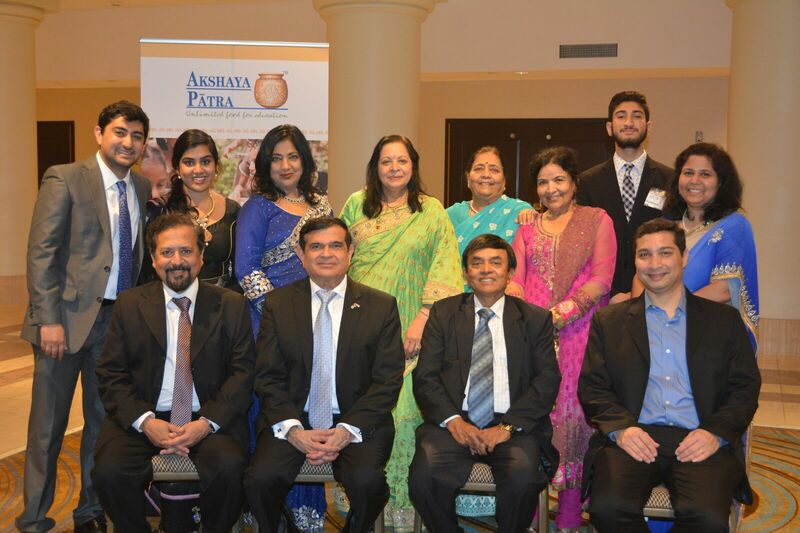 “I have been with Akshaya Patra for the last 10 years since their inception in New Jersey. I feel that this is a great cause not only because it provides a hot meal to children but it also entices them to come to school and receive an education. This is a very good initiative started by Gururaj “Desh” Deshpande and I will continue to support it in the years to come,” Dr. Parikh said, in a statement. Kapoor also auctioned off his aprons during the event to help those in need. Vandana Tilak, the CEO of Akshaya Patra, shared a compelling presentation about the organization and its mission, which is to feed five million children by 2020. From serving just 1,500 children in five schools in 2000, the organization now feeds about 1.7 million children in 14,125 government schools each day with the help of 5,800 employees in 38 ISO standard centralized kitchens in 12 states in India. The event also included special guests, Gururaj “Desh” Deshpande, who serves as the Board Chairman for Akshaya Patra Foundation USA and his wife Jaishree, along with volunteers and co-chairs of the New Jersey Chapter; Dr. Anand Kulkarni, Kiran Kothari, Haresh Patel and Dr. Rachana Kulkarni. Today, Akshaya Patra is the world’s largest non-profit school meal program and has 19 chapters in the United States. The National Green Tribunal took today strong note of frivolous petitions being filed in the name of the environment and said 50 per cent of the cases were filed by blackmailers. A bench headed by NGT Chairperson Justice Adarsh Kumar Goel said the tribunal would deal with only those cases which have an important question relating to environment and ecology. "Nowadays 50 per cent of cases are of blackmailers...Earlier, we used to issue notices...But now we are not issuing notices and disposing of the cases," Justice Goel observed. The observation came while disposing of a plea seeking a stay on the construction of 70-storey Vrindavan Chandrodaya Mandir in Mathura by ISKCON and asked the petitioner to approach authorities for its grievances. The green panel noted that 'Vrindavan Chandrodaya Mandir' being built by ISKCON had all the requisite approvals. The plea filed by one Manikesh Chaturvedi had alleged that construction of 'Vrindavan Chandrodaya Mandir' by ISKCON in the vicinity of Yamuna would harm the environment and also impact the groundwater level in the area. When completed, Vrindavan Chandrodaya Mandir will be the tallest religious monument in the world, it is claimed. 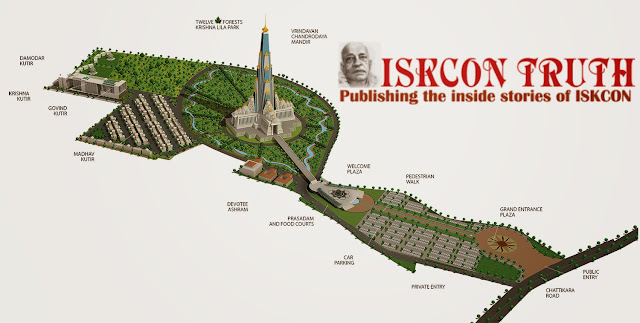 To be built at a cost of Rs 300 crore, it will be one of the most expensively built temples in the world by ISKCON Bangalore. The temple will rise to a height of about 700 ft, with a built-up area of 5,40,000 sq ft, according to the petitioner. A look-alike of the verdant forests of Vrindavan is planned to be recreated around this magnificent temple. It will be spread over a sprawling 26 acres. It will consist of the twelve forests of Braj, with varieties of lush vegetation, lakes with lotuses and waterfalls. The project is set in 62 acres of land and will include parking in 12 acres and a helipad. TIMES OF INDIA: NEW DELHI: A plea seeking a stay on the construction of a 70-story temple in Mathura by ISKCON led the National Green Tribunal on Thursday to seek a response from the religious society and the Central Ground Water Authority (CGWA). The plea alleged that construction of 'Vrindavan Chandrodaya Mandir' by ISKCON in the vicinity of Yamuna would harm the environment and also impact the groundwater level in the area. A bench headed by NGT Chairperson Justice Adarsh Kumar Goel issued notices to the International Society for Krishna Consciousness (ISKCON) and CGWA while seeking their replies before July 31. The plea by environment enthusiast Manikesh Chaturvedi sought directions to halt the construction of the temple, billed to be the tallest shrine in the world. "The proposed temple will have artificial water body around the boundary of the structure. This water is to be extracted from the ground which is likely to result in depletion of water level to the extent of the non-existence of the Yamuna riverbed," the plea said. When completed, Vrindavan Chandrodaya Mandir will be the tallest religious monument in the world, it is claimed. To be built at a cost of Rs 300 crore, it will be one of the most expensively built temples in the world by ISKCON Bangalore. The temple will rise to a height of about 700 ft, with a built-up area of 5,40,000 sq. ft, according to the petitioner. 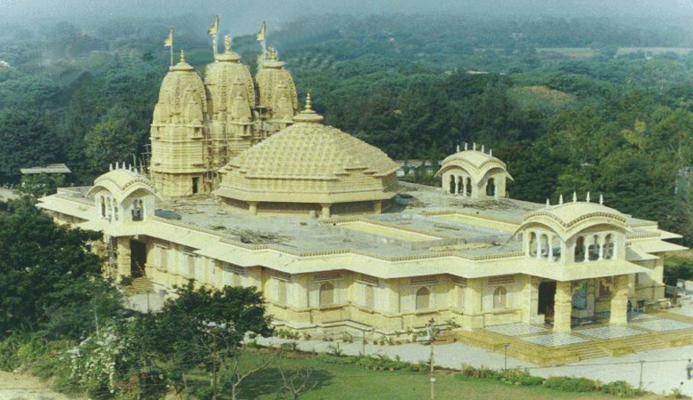 A look-alike of the verdant forests of Vrindavan is planned to be recreated around this magnificent temple. It will be spread over a sprawling 26 acres. It will consist of the twelve forests. TIMES OF INDIA: AHMEDABAD: A temple from Kathwada approached Gujarat high court seeking directions to the state government and police authorities to grant it permission to take out Rathyatra, a procession of Lord Jagannath, on July 14 in the eastern part of the city. Kathwada ISKCON temple (International Society for Krishna Consciousness), located in the periphery of Ahmedabad, sought permission from the police authorities to take out a Rathyatra in the area. It plans to take out the procession for the first time. The police had denied permission citing law and order situation and unavailability of enough force in wake of the Rathyatra that in the walled city on the same day, sources said. The temple management filed a petition in the high court contending that taking out religious procession is their fundamental right. On the main ‘Kumbhaprokshana’ day on Sunday, rituals such as ‘Poornahuti’, ‘Prana Prathistha’ and ‘Samporkshana’, among others, were performed in the presence of Sri Chinna Jeeyar Swamy. 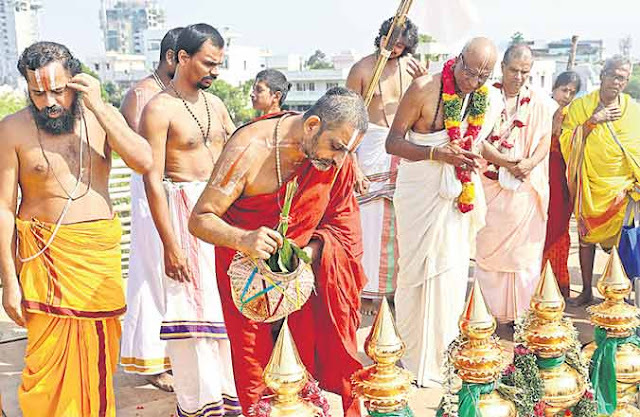 Telangana Today: Hyderabad: Telangana’s first golden temple at Hare Krishna Movement (HKM) — Swayambhu Sri Lakshmi Narasimha Swamykshetram — at Banjara Hills Road 12 was inaugurated by Vice-President M Venkaiah Naidu on Sunday. The once old and small temple has been changed into a golden structure by HKM, Hyderabad. The 40-ft main ‘gopuram’ (gatehouse tower) of the temple has been plated with gold, besides gopurams of other temples, including Sri Panchajanyeshwara Swamy, Sri Garuda, Sri Radha Govinda and Sri Anjaneya Swamy, in the complex. A total of 4.5 kg gold was used for this. After offering ‘Pattu Vastralu’ and ‘Thalambaralu’ for the first kalyanam of Sri Lakshmi Narasimha Swamy, Naidu said temples have been the centres of India’s cultural ethos from time immemorial. They have been centres of music, dance and spiritual upliftment of the masses, he said. Naidu said he was impressed by the gamut of services being rendered by HKM, and lauded initiatives were taken up by it such as food distribution programmes of Akshaya Patra, Bhojanamritha , Saddhi Moota (feeding farmers and ‘hamalis’ in market yards) and Akshaya Alpaharam. Madhu Pandit Dasa, chairman of Akshaya Patra Foundation and HKM, president of ISKCON Bangalore, thanked all the donors who contributed generously to the cause. Chanchalapathi Dasa, vice-chairman of Akshaya Patra Foundation and HKM, vice-president, ISKCON, Bangalore, Endowment Minister A Indrakaran Reddy, Mayor Bonthu Rammohan, MP K Keshava Rao, former Union Minister and MP Bandaru Dattatreya, MLA G Kishan Reddy and devotees participated in the event. TIMES OF INDIA: Iskcon Bangalore president Madhu Pandit Dasa, on Saturday, said after the success of Akshay Patra Foundation, Iskcon will soon venture into the education sector by providing free education to at least 25,000 underprivileged children on one single campus. Madhu Pandit Dasa, also the chairman of Akshaya Patra Foundation, said 32 kitchens are being built across the country under Akshaya Patra programme. “We are already running 36 kitchens,” he said. He was awarded Padma Shri for his mid-day meal service at schools rendered under Akshaya Patra initiative. He said the foundation aims to feed five million children by 2020. Madhu Pandit Dasa is the brainchild behind Telangana’s first golden temple dedicated to Swayambhu Sri Lakshmi Narasimha Swamy. The temple is located on road no. 12, Banjara Hills. When asked about the gold plating, he said it was done to attract people of all classes. “We have to make it glittery. If I sit under a tree, no one will come to me,” he said. The IIT graduate was attracted towards the spiritual path after reading books of Srila Prabhupada, the founder-acharya of Iskcon, during his college days. Akshaya Patra Foundation is based on spiritual leader Swami Prabhupada’s principle of no child going hungry. It has taken upon itself the responsibility of providing food to children in schools across different regions of the country. Times Of India: Akshaya Patra’s first kitchen in London serves 2,000 vegetarian meals to poor students and the homeless. No one is aware an Indian charity is funding their meal. For the past two years, Akshaya Patra Foundation UK/Europe focus has been on fundraising to help pay for 1.6 million midday meals for schoolchildren in India. 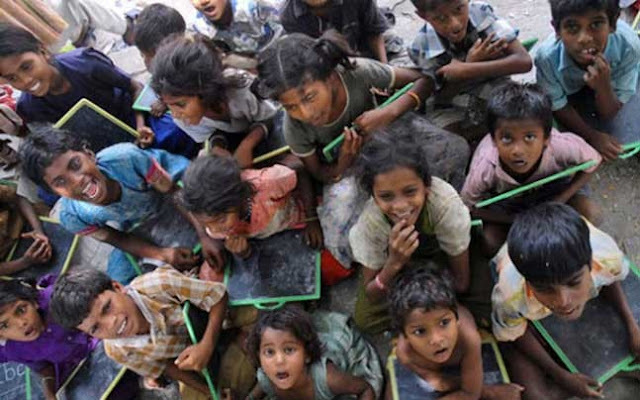 But the Indian charity has now turned its attention to the poor in Britain. It has opened its first kitchen in London and started serving 2,000 nutritious vegetarian meals per day for free to students and the homeless. Next, it will expand to schoolchildren, the elderly and hospital patients. Half a million children go to school hungry in the UK, 70,000 of whom live in London. A 2,000-sqft makeshift kitchen has been carved out of the basement of a building in Holborn where members of the UK charity Food for All make vegetable stew, pasta, and superfood porridge. 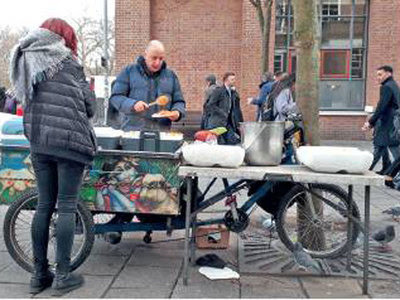 Akshaya Patra has teamed up with the charity to cook and distribute the food in vans and by rickshaws to three feeding points in London for homeless people, and to SOAS (School of Oriental and African Studies) and LSE (London School of Economics) for poor students. “Food for All had the manufacturing licences and experience. We will scale it up and make it more organised,” says CEO Bhawani Singh Shekhawat. The philosophy is the same as that used to create mid-day meals but recipes are suited to the local palate. “We don’t offer sambar but it is still ayurvedic, protein-balanced food with no additives and we don’t re-heat,” he adds. Last summer, as a pilot the charity offered meals to 100 schoolchildren at a holiday club at Newham Catholic College. In the UK three million children go hungry during the holidays. “There are families of six living on a food budget of £80 a month who cannot afford to feed their children. Many working parents send their children to these holiday clubs with a bag of crisps. The last meal they had was at 6pm the night before. It is the responsibility of the state but there is a lack of funding,” says Shekhawat. At the kitchen, Parasuram Das, who founded Food For All and is the head of manufacturing at the Akshaya Patra UK project, is delighted. He had emailed Goldman Sachs the day before, introducing himself as a new bank next door to theirs — except his was a “food bank.” “The next morning they were down here seeing how they could help,” he says. As we speak someone from a building company working on the construction of Goldman Sachs’ new London offices arrives and offers to pay for all the paper plates worth £250 a week and a £35 sack of dal a day. Das goes around supermarkets each evening collecting wonky vegetables, short-dated products and supermarket surplus which he uses to make dishes. He also receives donations from wholesalers who supply Indian supermarkets in the UK. Udupi, March 07, 2018: ISKCON Bangalore in association with Sri Krishna Matha, Udupi celebrated Sri Chaitanya Sambhramotsava at Rajangana Hall in the Matha’s premises on March 4, 2018, from 7:30 a.m. to 1:30 p.m. It began with kirtans by ISKCON devotees. The event was held to commemorate the divine advent of Sri Chaitanya Mahaprabhu, the spiritual revolutionary who stressed the performance of bhakti-yoga unto Lord Krishna and spread the Harinama sankirtana across India, over 500 years ago. Sri Chaitanya Mahaprabhu belongs to the Madhva Gaudiya Sampradaya which originated from Sri Madhvacharya. Sri Madhvacharya established a temple of Lord Krishna in Udupi in the 13th century and since then it has been one of the major centres of pilgrimage in India. The inaugural ceremony was held in the gracious presence of His Holiness Sri Vidyadheesha Tirtha Swamiji of Paryaya Sri Palimaru Matha and His Holiness Sri Vishvesha Tirtha Swamiji of Sri Pejavara Matha. Sri Acharya Shrivatsa Goswami, scholar and religious leader, Sri Radharamana Temple, Vrindavan and Sri A Haridasa Bhatta, renowned Madhwa scholar were the Chief Guests. His Grace Madhu Pandit Dasa, President, ISKCON Bangalore presided over the ceremony. Prof. Mallepuram G. Venkatesh, Former Vice Chancellor, Karnataka Sanskrit University; His Grace Chanchalapathi Dasa, Senior Vice President, ISKCON Bangalore; His Grace Stoka Krishna Dasa, Vice President, ISKCON Bangalore; His Grace Vasudev Keshav Dasa, Vice President, ISKCON Bangalore and His Grace Rajiv Lochan Dasa, President, ISKCON Hubballi were among the other dignitaries who graced the event. He also released the book “Sri Chaitanya Sambhrama” which presents the teachings of Sri Chaitanya in Kannada as explained by scholars for the common man. Sri Haridasa Bhatta, quoting a verse from the Bhagavata said that even if one follows the religious duties perfectly, if his eyes are not filled with tears upon remembering Krishna or chanting His names, then all his performances are just useless labour. He mentioned three symptoms of bhakti as stated by Sri Madhvacharya – chitta drava (melting of the stone-like heart), sthairya (unflinching dedication to the Lord) and prasada (cheerful countenance). He went on to say that Sri Chaitanya Mahaprabhu is a great soul who, through the philosophy of achintya-bhedabheda-tattva, united all common people irrespective of the disagreement in their philosophical viewpoints and brought about a great revolution by spreading the message of bhakti. After the inaugural ceremony, Matajis from ISKCON Bangalore sang Bengali Vaishnava bhajans. 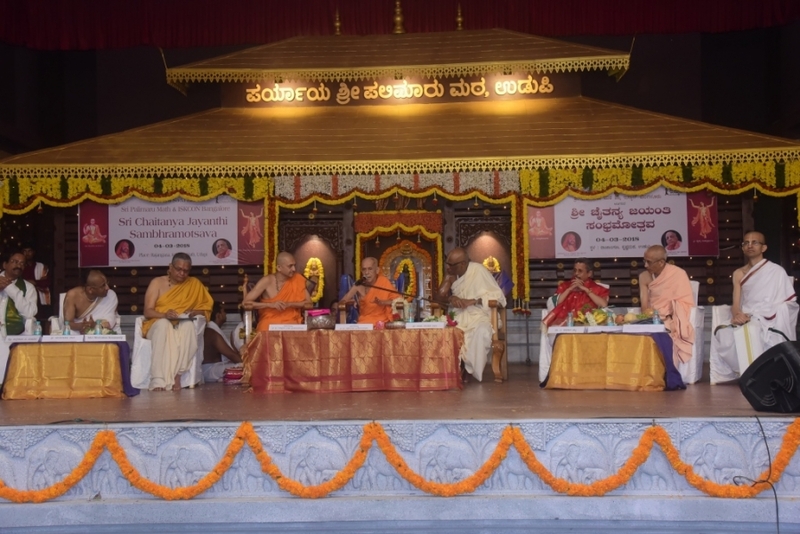 The next part of the event was Vichara and Kavya Gosthi – deliberations on the various pastimes of Sri Chaitanya’s life by eminent scholars and poets that included Nadoja B. V. Satyanarayana, Sri Gouripura Chandru, Sri S. Seetharamu, Dr. Durgapraveena, Dr. Kabbinale Vasantha Bharadwaj, Dr. Belavadi Manjunatha, Dr. T. G. Prabhashankara Premi and Dr. Rohinaksha Shirlalu. The themes of their narration and poetry were – Sarvabhauma Bhattacharya, Haridasa Thakura, Sanatana Gosvami and Sri Chaitanya’s South India Tour. The special invitees who attended the event included Prof. Sripathi Tantri, Udupi; Sri Ambathanaya Mudradi, Udupi; Dr. Heranje Krishna Bhatta, Puttur; Prof. M. L. Samaga, Udupi; Dr. Prabhakara Joshi, Mangaluru; Prof. Padekallu Vishnu Bhatta, Athradi; Dr. Satheesh Kumar Kemmannu, Nitte; Dr. Vasanthakumara Perla, Mangaluru and Dr. Shridhara Bhatta, Ujire. The final part of the event was an enthusiastic maha sankirtana by all devotees following which sumptuous lunch prasadam was served to all. The devotees also participated in the grand Ratha Yatra held within the temple precincts in the evening. While the Ratha carrying Lord Krishna traversed around the temple, devotees performed sankirtana and danced with bliss. Over 700 devotees from ISKCON Bangalore group of temples from different parts of the country participated in this event.